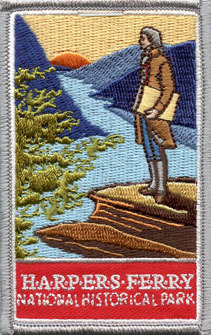 Measures 2 1/4" x 3 3/4" Depicts Thomas Jefferson viewing the water gap at Harpers Ferry. “The passage of the Patowmac through the Blue Ridge is perhaps one of the most stupendous scenes in Nature. . .This scene is worth a voyage across the Atlantic.” After visiting in 1783, this is how Thomas Jefferson described Harpers Ferry in his book, Notes on the State of Virginia.